Robert Burns – From: ” To a Mouse, on turning up in her nest with the plough”. In fact, we haven’t even signed on yet – my four sectors rostered for today have been delayed – and I’m already working on what apologies we’ll have to come up with to calm our disgruntled passengers…. The reason today is the knock-on effect of the icy conditions at another airport this morning – the early flights had to wait for the sun to melt ice off the wings. Fortunately we don’t have snowstorms (as in the picture above) in South Africa, but we do find temperatures falling to below zero in winter. Add a little moisture and then you could find contamination on the wings – which, if untreated, we well know the results of. Air Florida Flight 90 is but one example. As we don’t suffer from surface icing too often, we do not have de-icing facilities at any South African airports. Sunshine is our only salvation! So here we sit after a night stop, waiting for our delayed aircraft to arrive to continue our (delayed) eight-sector pairing. But that is scant comfort for our passengers who feel that they are entitled to an on-time departure and arrival. 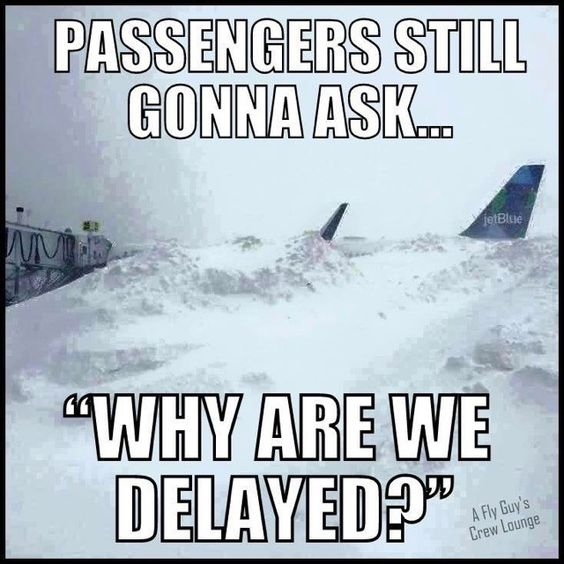 Weather is only one of the many reasons leading to flight delays. In SA thunderstorms are usually the culprits during summer; sometimes driving rain or fog results in go-arounds and diversions from airports with only CAT I or visual approaches. Many times the crosswind component is simply out of limits, ruling out an approach or necessitating a go-around. From our side its often because of an aircraft developing a technical problem, which, if it can be repaired on the line could result in a short delay of up to an hour. Some snags take more time, especially if specific spares or tools are required – if the aircraft is grounded, schedules have to be adjusted to find other aircraft to pick up the slack, often resulting in all of us kicking our heels for frustrating periods of time. Often such delays can lead to crews running out of flight and duty time, which legally necessitates later sign-on times for those who night stop at out stations. You should hear the chirps from furious passengers when we finally show up to operate such a flight – very thick skins are required! Explaining the safety aspect usually does not help much – I sometimes get the impression that passengers would rather depart unsafely, as long as it’s on time.. Sometimes the passengers are to blame – my pet hate is passengers who check in (with luggage) and then disappear between the counters and the gates. Its like socks – where the hell do they get to? Now we have to search for their loaded bags, inevitably the very last ones to be found. Some passengers are like hens arranging nests – why can’t they simply move in, and sit down? While passengers are standing around, going to the toilet or repacking their cases, we cannot close the doors. Late yet again. Many other reasons can be trotted out for delays. The bottom line, however, is that a delay is only that: A delay. It is not a disaster and it is not the end of the world! Our airline aims for a minimum target of 85% on-time departures (on time is defined as leaving within 15 minutes of the scheduled departure time) and has achieved that for six consecutive months now. After all – A safe flight and safely arriving at your intended destination is more important than fretting about a delay.